Carnival will no longer allow customers to bring bottled water aboard their cruise ships. Carnival is banning customers from bringing bottled water onto its ships. But the cruise line says the problem is booze, not H20. The company says that the new policy is designed to halt travelers from trying to smuggle alcohol on board, which they said has led to problems. "Bottled beverages are the most common means by which guests attempt to smuggle alcohol on board," said Carnival's statement. "When behavioral issues occur on board and are ultimately investigated, smuggled alcohol often appears to be a factor." The change should also speed up the boarding process, according to the company. But the cruise ship industry has been struck by outbreaks of illness that cause vomiting and diarrhea. 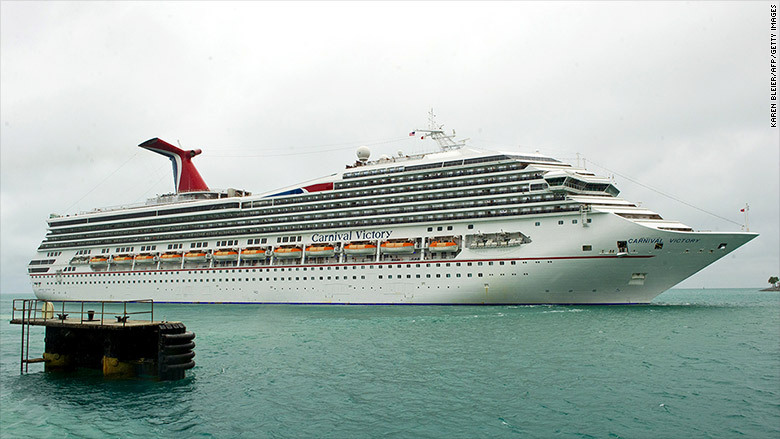 The Centers for Disease Control has reported nine such outbreaks of norovirus on board cruise ships in the first five months of 2014 alone, although the last instance reported on a Carnival Cruise Line ship was in 2012. Cruise ships also stop in some destinations where drinking water can be suspect, and some customer prefer to bring bottled drinking water with them when going ashore. Carnival says because of the change of policy it is lowering the price of bottled water that customers can purchase to $2.99 for a 12-pack of half-liter bottles if they are purchased ahead of the cruise, and $4.99 for the same 12-pack if it is purchased onboard. The new policy takes effect on July 9. The policy change applies to only Carnival Cruise Line, not other lines owned by parent company Carnival Corp. (CCL), such as Holland America, Princess Cruises or Cunard. A Carnival spokesman says each line sets its own policies. Customers could previously check cases of bottled water through with their luggage, but the company says it will now ban any bottles of non-alcoholic drinks. It will allow customers to bring board a maximum of 12 sealed cans or cartons of other non-alcoholic beverages such as soda, juice or milk. The company has previously banned alcoholic beverages with the exception of a single bottle of wine or champagne per adult passenger.